Glass never goes out of style and creates an absolute amazing and interesting environment within your bathroom. If you use more glass in your bathrooms, then it will look more appealing and mysterious. Glass will definitely change the look of your bathroom design when use carefully with a different style. Now glass is commonly used in the interiors premises to give a pleasing and functional look. Glass not only offers a unique look to your bathroom but also make the bathroom look spacious. If you want to remodel your old bathroom, it is a smart idea to use colored glass in bathrooms. The colored glasses are available in different forms such as bent, fused, roasted, and sintered. Halogen waterproof spotlights offer a twinkling effect with colored glasses and it will sparkle with all the colors of the bathroom. You can use this glass for washbasins, bathtubs and peculiar worktops. If you have small bathroom, then it does not make the appearance of the bathroom narrow. If you use glass in your bathroom, then it will completely turn into a stylish zone using innovative ideas. 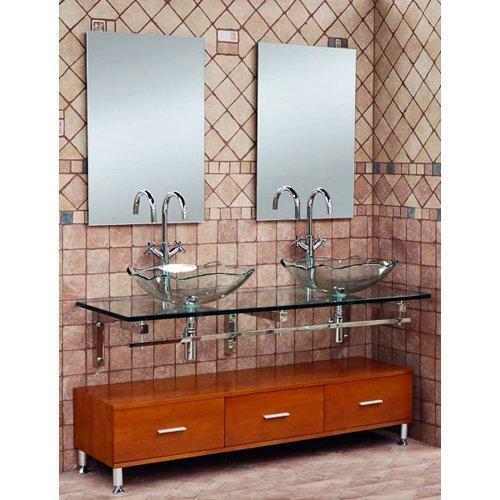 To update your bathroom, you can use modern glass vanities. 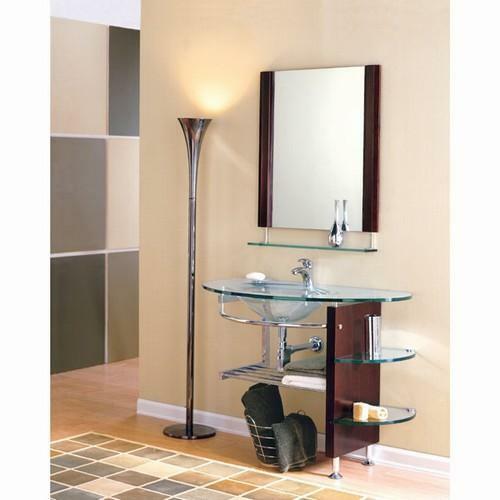 Glass vanities look wonderful in your bathroom but try to handle it very carefully. They will give a clutter free look to your bathroom. Storage open glass shelves allow you to access the bathroom accessories easily and clearly. 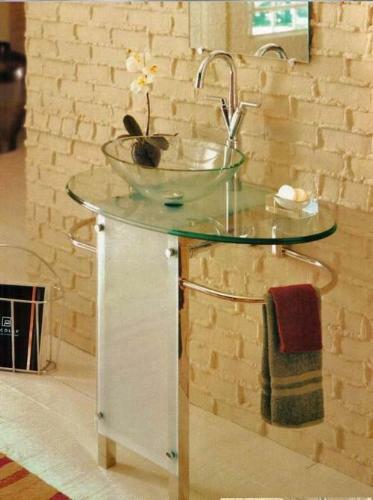 For a sophisticated look, glass vanities are generally mixed with chrome. 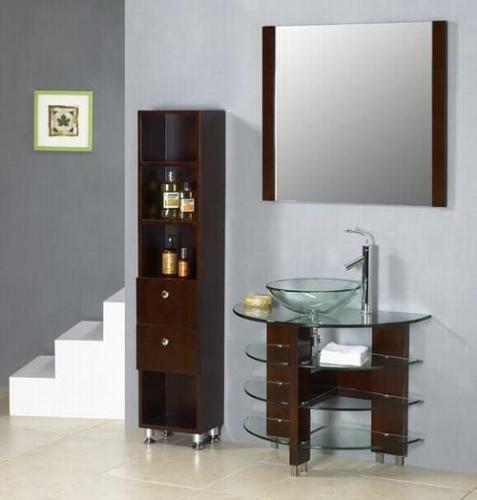 Always use the branded glass vanity so that there are less chances of their breakage. 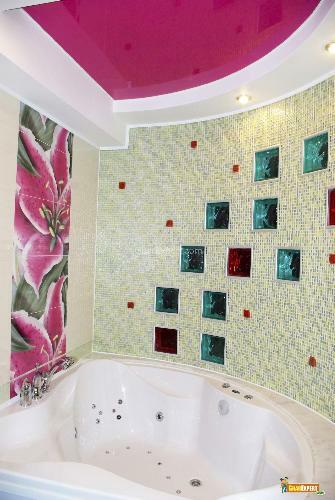 You can make your bathroom creative and sensational by using glass tiles. Glass tiles make your bathroom spacious and airy with high passion. You can create a matchless style with glass tiles if you add shells or other innovative objects to them. 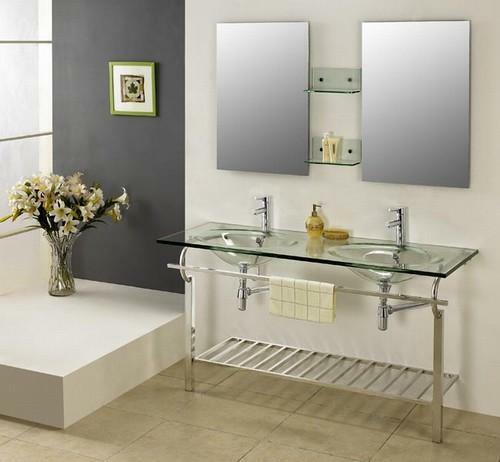 You can use mirrored tiles in modern bathrooms while Italian glass tiles in contemporary bathroom. If you want to introduce majestic look in your bathroom, then install black and white checkerboard tile design which will always be appreciating. The size and arrangement of tiles also affect the bathroom interior. Use of rectangular tiles makes the small bathroom bigger. You can also set up glass tiles around mirror frames or on the bathroom walls to make the bathroom more pleasing and luxurious. To keep privacy, it is good to use different patterns of glass block windows. Glass block windows decrease the heating and cooling costs as they are more energy efficient than single pane glass, Single pane glass windows often fog up with a increase in heating and cooling costs. Glass block windows offer you obscurity as well as style to your existing bathroom. Glass block windows give you additional security as compared to the traditional windows which can be an easy target for break ins. Actually glass block windows come with a vinyl frame and nailing fin that will give you outstanding security. They are easy to clean with soap and water or window cleaning solution. You can match the glass block windows with any style such as contemporary, traditional or transitional design style. Maintenance of glass block windows is easy as compared to the existing bathroom windows as they are either mortared in or nailed into the framed walls properly. One of the popular styles of today that is gaining popularity is glass countertops. It is a non-traditional style but looks gorgeous when implemented in the bathroom. Glass is resistant to steam, humidity, and moisture. You can just wipe off the glass and the moisture has disappeared. Glass countertops are transparent and make your bathroom spacious. 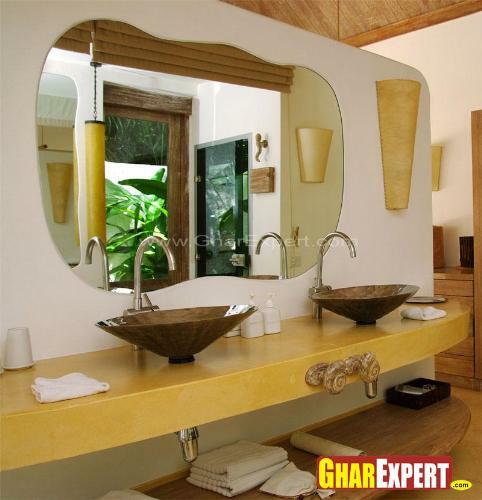 They boost up the bathroom interior with an innovative style. If you place flowers, candles or other decorative objects under the glass countertops, then it will look highly appreciating in the bathroom. Always choose a specially designed glass that has high thickness so that it can not break easily in adverse conditions. In bathrooms, you can create open glass shelves that will give you the space for placing bathroom essentials in a different style. The glasses are available in different types such as tinted, transparent or matte etc. Now a new type of “Variable Transparency Glass” is available in the market which is unbreakable and safe and adds an air of some mystery in the bathroom aura. This special glass looks transparent when the lights are on but it becomes matte when the lights go down. Glass shelves also come with decorative mirrors which will give your bathroom an individual style. 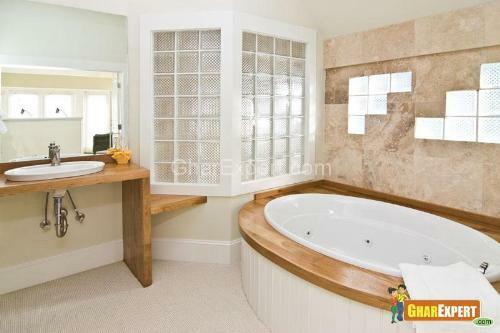 Glass walls or doors or partitions are suitable for the places where bathroom is attached with the bedroom. You can replace the wooden doors with the glass doors for an appealing effect and to improve the look of your bathroom as well as the bedroom. Movable panels or shields consist of transparent or matte glass. The glass wall gives you the illusion of an additional room. If you opt for an interesting look in your bathroom, then it is right to choose stained glass. Stained glass when used on the bathroom wall that adjoining the room offers an absolute special look to the adjoining room. When you switch on the lights in the bathroom, then you can take pleasure the sight of the stained glass from the adjoining area and it will look outstanding. You can make your bathroom beautiful and elegant by using glass shower enclosure. If you choose shower curtains, then there are chances of growing molds and bacteria in them and they may be totally unhygienic to you. But with glass enclosures, you can make your bathroom environment healthy and bacteria free. Glass enclosures are available in various finishes and designs such as clear, frosted, patterned and stained. You can improve the look and feel of your bathroom with stylish glass shower enclosures. 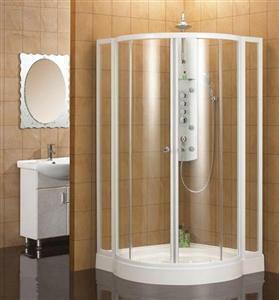 A wide range of styles and designs of glass shower enclosures are available in the market. But if you have small bathrooms, then choose corner styled glass enclosures which offer a high degree of functionality and will create an illusion of more space. Stand alone type glass enclosure looks exciting in the bathroom design. Glass shower enclosures are easy to clean and can be maintained very easily.